2. 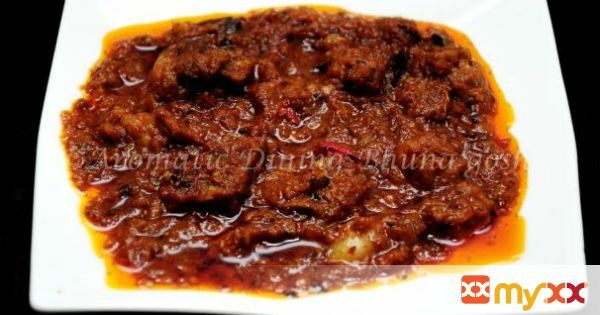 Marinate mutton by combining yogurt, half quantity of following spices – Coriander powder, cumin powder, red chilli powder, pepper powder and salt. 3. Mix well with the meat and leave for 20 mins. 4. Chop the onion, ginger, garlic and green chillies finely. 5. Blend the tomatoes in a blender and set aside. 7. Heat 1 Tbsp Oil in a large skillet. 8. Turn to medium heat and add cumin seeds. 9. When it splutters add the spices bay leaves, cinnamon, green cardamom, cloves, and black cardamom pods respectively. 10. Add chopped garlic ginger and sauté well for 1 min. 11. Now add the chopped onion and green chilli along with little salt. Adding salt will ease the frying process. 12. When the onions have turned to brown, sprinkle mace and nutmeg powder. Sauté for few seconds. 13. Add in the blended tomato and combine well. 14. Add the marinated meat. 15. Pour 2 cups of water, mix well and reduce the flame to low. 16. Close the lid and cook for 30 mins stirring in-between. 17. After half an hour check for salt and add salt if required. 18. If the gravy is dry add little more water and cook another 15-20 mins or till the oil floats and the gravy is thick. 19. Garnish with coriander leaves and sliced onion. 20. Serve with naan, rice or any Indian bread.